What if the photograph of your son/nephew/brother was used as the face of a twitter campaign to stop Pedophilia targeted at and abusing young boys? Would that be ok with you? There were three photos that were taken from either my website or the Alexia Foundation website, and someone made these images the face of the campaign. But these photos had nothing to do with the girls who were kidnapped and sexually trafficked. There are many times when I get upset when people take my photos without permission, but this isn’t about that. I support the campaign completely and I would do anything to bring attention to the situation. It’s a beautiful campaign that shows the power of social media. This is a separate issue. These photos have nothing to do with those girls who were kidnapped. These girls are from Guinea-Bissau, and the story I did was about something completely different. They have nothing to do with the terrible kidnappings. Can you imagine having your daughter’s image spread throughout the world as the face of sexual trafficking? These girls have never been abducted, never been sexually trafficked. I know these girls. I know these families, and they would be really upset to see their daughters’ faces spread across the world and made the face of a terrible situation. The photos were taken from two separate stories. I was there in 1993, in 2000 and then in 2011 for the Alexia Foundation. I lived there for six months, learned the language, learned about their lives and became very close to all the people in these pictures. I wanted to put a human face on conflict. But when I got there my story changed. Because I realized the way Africa is generally portrayed in mainstream media is either wars, famine or stories like this terrible abduction. You see the horrors or the other extreme, beautiful safaris and exotic animals. There’s nothing in between. So it’s ironic the story I was telling was that there is a beautiful world that lies between these two truths. Why don’t we ever tell these stories that show the dignity and resilience of these people? And this is why I feel so enraged, because I was trying to not show them as victims. They are not victims. Using these images and portraying them as victims is not truthful. The story I did was a hopeful story. One of three girls who were photographed by Ami Vitale in Guinea-Bissau in 2000 and whose images have been used — without permission — in the online campaign raising awareness of the recent kidnappings in Nigeria. Tell me about the girls. The picture of the girl outside the school was the image used most frequently. The girl’s name is Jenabu Balde, and she is a cousin of the family I lived with. Umou Balde is her mother and she is a dear friend. I lived with them and went back in 2011 to visit them. The point of the story was to show that the girls were going to school and life was getting better in many ways. How did you learn the pictures had been misappropriated? Eileen Mignoni from the Alexia Foundation spotted this first, and the whole board of the foundation was very quick to respond. Mickey H. Osterreicher [a lawyer with the National Press Photographers Association] has been incredibly helpful as well, citing the legal issues and ramifications. 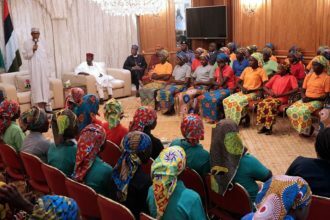 How do you feel that someone found it acceptable to substitute these girls for the Nigerian girls who were abducted? This is personal. Even if they weren’t dear friends, it’s the principle. We can’t pick up any photo and use it out of context. I can’t help but wonder that they thought this was O.K. just because my friends are from Africa. If it were white people from another country in the photos, this wouldn’t be considered acceptable. What was your arrangement with the subjects of your story? I feel a sense of responsibility to the people I photograph. I go into communities and I make a promise that I will be responsible with their images and that I will deliver the message that they articulate to me. We are responsible as photographers and journalists when we make promises to do justice to their stories and honor them in the way that they have honored us by sharing their stories. I need to follow through with this one. How are you following through? I spent my whole day Wednesday trying to track down the people who are spreading these images. I tweeted back to scores of people asking them to remove the photos. The BBC and Chris Brown retweeted it and it was everywhere. At first the woman from the BBC refused to take it down because it was already out there in the Twittersphere, But after a long exchange they removed it. Chris Brown did not respond. Ami Vitale is a photographer and filmmaker who has worked in more than 85 countries. She is a contract photographer for National Geographic and works with the Photo Society and Ripple Effect Images, and is represented by Panos Pictures. Her photos of Kenyan communities protecting their wildlife from poaching were featured on Lens earlier this year.